The water coming into your home makes a journey through a system of pipes, and it’s usually cold or cool, depending on the time of year. To have water warm enough to take a hot shower or bath, or use your dishwasher or washing machine, you need a water heater. Water heaters are familiar fixtures in most homes. They typically look like big metal cylinders, tall drums that are often consigned to a laundry room or basement. Newer styles have some interesting features, like losing the tank completely in favor of water-on-demand, but the old, reliable water heater design that’s most widely used in the U.S. today is really a pretty simple appliance; it’s basically a drum filled with water and equipped with a heating mechanism on the bottom or inside. Even though they lack drama and complexity, water heaters are still pretty amazing. What makes them interesting is that they exploit the heat rising principle to deliver hot water right to your faucet with a minimum of fuss. Don’t let the simple shape shrouded in its wooly insulating blanket fool you. Water heaters have an ingenious design on the inside for something that looks so ordinary on the outside. Tank – The inner shell of a water heater is a heavy metal tank containing a water protective liner that holds 40 to 60 gallons (151 to 227 liters) of hot water at around 50 to 100 pounds per square inch (PSI), within the pressure range of a typical residential water system. The exterior of the tank is covered in an insulating material like polyurethane foam. Over that, there’s a decorative outer shell and possibly an additional insulating blanket. Dip tube – Water enters the water heater through the dip tube at the top of the tank and travels to the tank bottom where it’s then heated. Shut-off valve –The shut-off valve stops water flow into the water heater. It’s a separate component from the heater located outside and above the unit. Heat-out pipe –Suspended toward the top of the tank’s interior, the heat-out pipe allows the hot water to exit the water heater. Thermostat – This is a thermometer- and temperature-control device. Some electric water heaters have a separate thermostat for each element. 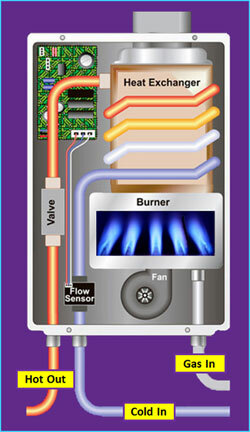 Heating mechanism – Electric water heaters have heating elements inside the tank to heat the water. Gas water heaters use a burner and chimney system instead. Drain valve – Located near the bottom of the exterior housing, the drain valve makes it easy to empty the tank to replace the elements, remove sediment or move the tank to another location. Pressure relief valve – This safety device keeps the pressure inside the water heater within safe limits. Sacrificial anode rod – Made of magnesium or aluminum with a steel core, the sacrificial anode rod is suspended in the water heater tank to help retard corrosion. Let’s take a close-up look at what’s going on inside a water heater’s tank to see how simply and elegantly it does its job. A water heater’s thermostat controls the temperature of the water inside the tank. Normally, you can set the temperature anywhere between 120 and 180 degrees Fahrenheit (49 to 82 degrees Celsius). The water temperature setting recommended by most manufacturers is between 120 to 140 degrees Fahrenheit (49 to 60 degrees Celsius). This is hot enough to be efficient for household use, but not so hot that it can pose a scalding risk. If there are children living in your home, it’s wise to stay closer to the lower end of the range. Setting your water heater to a lower temperature saves energy, too, and if you remember to dial back the heat when you go on vacation, you’ll experience even more energy savings. Usually, the thermostat is located underneath a protective cover plate and has a knob or dial you can turn to set the temperature. The dip tube feeds cold water from your home’s water lines to the bottom of the tank’s interior, where the water starts to warm up. The heating mechanism, either a burner or an element, stays on until the water reaches temperature. As the water heats, it rises to the top of the tank. The heat-out pipe is located near the top of the tank. Water exiting the water heater at the top is always the hottest in the tank at any given moment because it’s the nature of hot water to rise above denser, cold water. The secret to a water heater’s design for separating cold, incoming water from hot, outgoing water is that it relies on the principle that heat rises to do the hard part. The position of the heat-out pipe at the top of the tank does the rest.